Live album by Louis C.K. Louis C.K. has slowly been evolving from a dependably funny stand-up to the comedy lovechild of Bill Hicks and George Carlin. [...] If you don't find yourself nodding along with C.K. in fierce agreement, and even occasionally pumping the air with a raised fist salute, you're either dead inside or a member of that "crappiest generation" C.K. was talking about. Somehow, Louis managed to do something even Obama has had a difficult time pulling off lately: Finding the silver lining of our nation's ongoing economic collapse. In less than five minutes, C.K. made a convincing case that capitalism's death knell might not be such a bad thing after all. Sure, it could mean donkeys will become our primary source of transportation, but it could also lead to the triumphant return of rotary phones and manual credit card machines. While on his tour, C.K. also landed a deal with FX to shoot a pilot featuring a loosely autobiographical depiction of his life as a single dad living as a comedian in New York City. Soon after, the show was placed for an order of 13 episodes, requiring a new hour of material aside from the hour written for the Hilarious tour. He stated on the podcast WTF with Marc Maron that his 4th hour went into the show but was performed with the Hilarious material on the same tour. At the end of the tour, C.K. filmed the material as his third one-hour special at the Pabst Theater in Milwaukee during April 2009, with C.K. himself serving as director and editor. It was filmed as a concert special, and was screened in movie theaters in eight cities: namely, Austin, Boston, Chicago, Los Angeles, New York City, Philadelphia, San Francisco, and Washington, D.C. It was mixed by Jon D'Uva of New York and recorded by Skeyelab Music of Chicago. Hilarious is also available on DVD and it is completely uncensored. The DVD was shown at Sundance and was received extremely well. Hilarious was praised by critics, with Punchline Magazine writing an extensive review on C.K. 's performance, saying: "From each new hour of C.K. material, we've come to expect an emotionally rich, soul-baring performance; Hilarious gives us exactly that.... In the end, Hilarious will be remembered as one of the strongest stand-up comedy performances in the history of the art." 1 2 "Past Winners". GRAMMY.com. Retrieved 2014-08-24. Louis C.K., artist. Jon D'Uva, engineer/mixer. Jack Vaughn, Michelle Caputo & Shannon Hartman, producers. 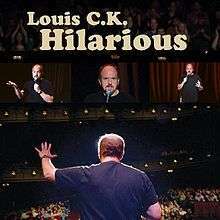 ↑ "Louis C.K. 's "Hilarious" hits the big screen for one day; all the ticket info you'll need is here". Punchline Magazine. August 27, 2010. Retrieved 2014-08-24. ↑ Comedy Central Press | COMEDY CENTRAL RECORDS, "LOUIS C.K. : HILARIOUS" CD RELEASED ON COMEDY CENTRAL RECORDS ON JANUARY 11. ↑ Louis C.K. 's Website, "Louis CK Hilarious" tour is going on sale. ↑ YouTube "Everything's Amazing & Nobody's Happy" Check |url= value (help). Retrieved 12 April 2015. ↑ Spitznagel, Eric (2009-03-02). "Louis C.K. : 'Starvation Can Be Character Building'". Vanity Fair. PlanetOut. Retrieved 2009-03-02. ↑ Snierson, Dan (Aug 26, 2010). "Louis C.K. 's concert film 'Hilarious' to debut on big screen in eight cities". Entertainment Weekly and Time Inc. Retrieved September 23, 2014. ↑ CD Credits, Photo of the CD credits. ↑ Punchline Magazine, Louis C.K. — ‘Hilarious’. 1 2 Billboard, Comedy Albums 01/29/11.